Note: Be sure to check out Sean Metcalf’s (@Pyrotek3) post about this technique available here! He talked about this at BlackHat USA 2015! Benjamin Delpy (@gentilkiwi) recently tweeted about adding External SIDs into Mimikatz’s golden tickets which was quickly followed up by Skip Duckwall (@Passingthehash) also tweeting how devastating this addition can be to defenders. Skip said it best by saying, “Pwning the child can (with default settings) compromise the parent”. This capability has a fairly significant impact for both attackers and defenders. If as an attacker I can just target the weakest child domain and leverage that access to compromise the parent domain, my attack path just potentially became significantly easier. As a defender, I now know that if any child domain is compromised, then the integrity of the forest as a whole is now in jeopardy. As you can see, there’s a bidirectional trust between the child and parent domain. Now that it looks like I have everything setup the way I would like it to be, it’s time to test creating a golden ticket with an external SID. To give some context to how I am testing this scenario, I will be running all commands from a workstation within the child domain and will be logged into the workstation in the context of a user within the child domain. The first step I will perform is to download Mimikatz onto this workstation and purge all kerberos tickets. Now that all tickets have been purged, let’s verify that I cannot access either the child domain’s domain controller’s C$ share, or the parent domain’s domain controller’s C$ share. Once I’ve obtained all the information I need, it’s time to create the golden ticket. In this case, you can see I am referencing the 519 group which is the Enterprise Admins group within the external SID. If you are looking to change the group you wish to “add” yourself into, some default group values are available here. I’m also using /ptt to immediately submit the ticket. Now that my ticket has been submitted, it’s time to open a command prompt with the submitted ticket applied to it. Sweet! My normal domain user account within the child domain now has access to not only the child domain’s domain controller’s C$ share, but I can also access the C$ share on the parent domain’s domain controller since I am essentially running in the context of an Enterprise Admin! At this point, I can leverage any number of techniques to move into the parent domain. Needless to say, this is something that I will look for on future assessments. Those posts are significantly more authoritative on the subject than mine, I just wanted to write this out so I can reference this on assessments. Golden tickets can offer an extremely powerful to escalate privileges for an attacker on a network, or obtain access to resources which are only available to a select group. However, it’s absolutely worth mentioning that with this great power, pen testers need to take extra precaution to protect any golden tickets that they’ve created. It’s highly recommended that any tickets created should be securely encrypted during your assessment, and securely deleted when it is no longer needed. Golden Tickets can be generated two different ways. The first way is through the kiwi extension in Metasploit, and the other is through Mimikatz’s stand alone application. This post will show how to use both options to generate your ticket. Lets start off with Metasploit’s Kiwi Extension. In this case, I can see (and I know) the domain name is PwnNOwn.com. So, this info should also be saved off to a text file. The last big hurdle that you will need is the nt hash from the krbtgt account. Since you should be on the DC, perform a hashdump and obtain the krbtgt hash. We can see from the previous picture that the ticket was successfully created and written out. The user that we are impersonating is “invaliduser”, and the ticket is saved to /root/Downloads/invaliduser.tck. In the above screenshot, I cleared all existing tickets, then applied the created ticket, and then we can see the golden ticket in use. Note: you don’t have to purge existing tickets, but I did for demonstration purposes. The user account could not previously access the DC’s C$ share, but with the ticket applied, it can! We’re now operating with the same level of permissions as a DA! In this case, we’re creating a ticket for a non existent user account, the User ID is at its default value (500), and we’ve added groups that the user should be part of. 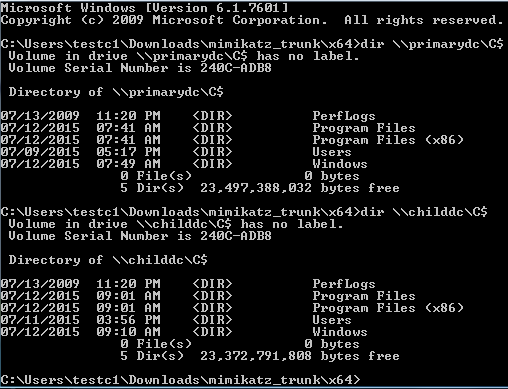 The ticket is saved to the invalidadmin.tck file within the same directory that the mimikatz binary is running from. We can actually also see from the DC that the Logon was successful, even though it was with an account that doesn’t exist within the domain! And that’s about it! Writing this out helped me gain a better understanding about generating and using golden tickets, hope that it can help someone else too!